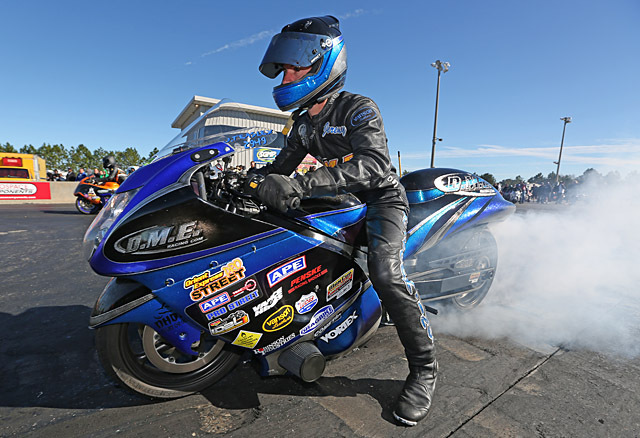 For the second straight year, motorcycle drag racing fabrication powerhouse DME Racing partnered with Dave and Jason Dunigan’s Dunigan Racing, and Chris Connelly and his Pro Stock Inc., to put on the DME Racing All-Star Pro Street Shootout. 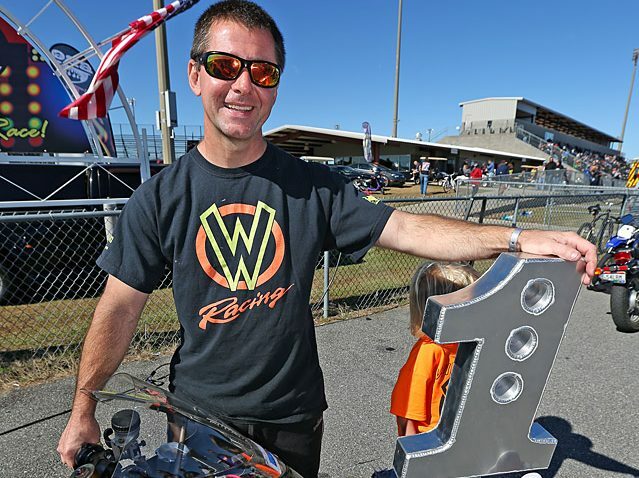 This $10,000-to-win event for the world’s quickest streetbikes was run on November 16-17, immediately preceding the 2017 Manufacturers Cup World Finals at South Georgia Motorsports Park in Valdosta. 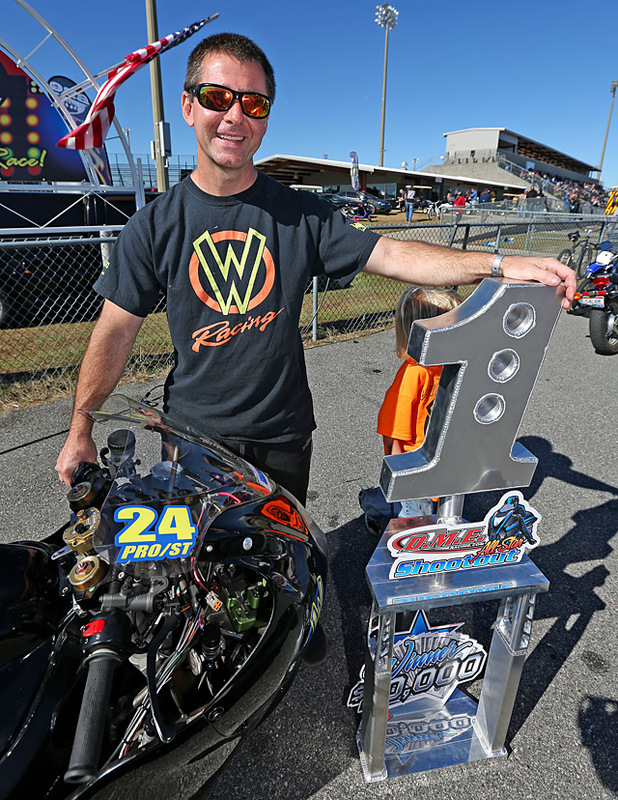 Mark Paquette didn’t win the first Shootout last year, but he did have the quickest bike—nearly the sport’s first 6.60something pass with a 6.70. After parking the bike for a full year, Paquette was right back in the Georgia groove, qualifying number one this year and running another 6.70 to advance out of the first round. After a round 2 bye, Paquette put a .000 light on Justin Shakir in round 3 and was beaming with confidence entering the semis. But that’s where it fell apart for Paquette and his teammate Bud Yoder. Yoder had a healthy staring line advantage over DME’s Jeremy Teasley, but number two qualifier Teasley’s DME power kicked in when he needed it and drove him around Yoder. In the other semi, Paquette’s series of smooth passes came to an end and he lost to the man who did run the sport’s first 6.60something— Rodney Williford. 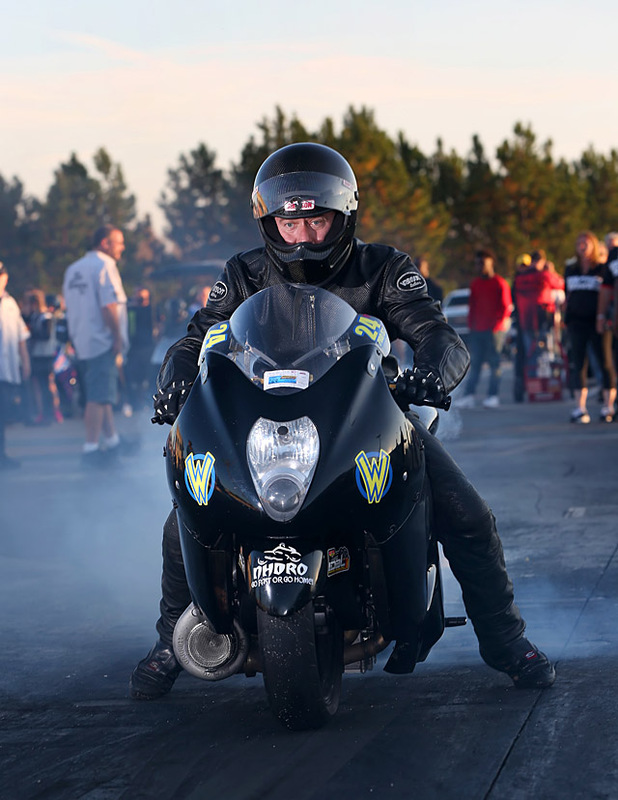 Williford has been the performance leader at Pro Street races around the country all year, and he entered the Shootout final round between 700 horsepower, street legal, turbocharged Suzuki Hayabusas with lane choice against Teasley. It was a great race, with Williford taking the tree by .014 and running 6.73 at 221.85 mph against Teasley’s 6.76 at 216. Williford attributed his 2016 dominance to hard work and good choices. “We tested every chance we got in the offseason and found out would and would not work, so we just stayed focused on what did work with the chassis, clutch, and power management. We tried to stay in the window of what we knew worked and it kept us more consistent this year. “We were welcomed by everyone we met, and everyone said that they were happy that we made it,” said Lund, who coincidently raced frequent European opponent Venables in the first round of the Shootout. “I still can’t believe that I went there to the homeland of the sport we all love and made 13th in qualifying for the Shootout, only to race Ven, that I could have raced all year at home! What are the odds? As always, the event included a fabulous BBQ buffet and distribution of prizes sponsored by many of the sport’s greatest companies and individuals.